What's Wrong with the US Smartphone Market? 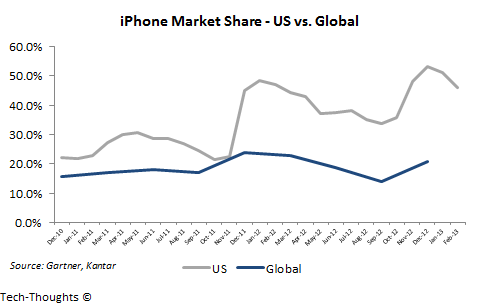 The US smartphone market has long been dominated by the iPhone, at least compared to the rest of the world. The latest figures show a US-Global market share gap of more than 30%. Analysts have attempted to explain this disparity by pointing to carrier subsidies and the strength of Apple's brand in the US. The goal of this post is to study pricing models prevalent in various markets and compare those to the iPhone's market share in that market. It is a bit unfair to compare the position of the iPhone in the US market, emerging markets where prepaid smartphone sales are the norm and per capita income is lower. So let's restrict our analysis to developed markets, specifically the UK and Australia, which are more iPhone-centric as compared to other developed (& subsidized) markets. The above prices are from AT&T's website, from which I sampled a set of 7 devices. Unsubsidized priced of these devices range from $379 for the Samsung Galaxy Exhilerate to $649 for the iPhone 5 and Samsung Galaxy Note 2. Even though the unsubsidized price shows wide disparity, the highest contract price (for the Galaxy Note 2) is just 14% higher than the lowest (Samsung Galaxy Exhilerate). The difference between the iPhone 5 and Galaxy Exhilerate is even lower at ~10%. This is because the pricing model followed by US carriers insulates the monthly price of a data plan from the upfront subsidized price of a device. As a result, one data plan costs the same on a Samsung Galaxy Exhilerate or an iPhone 5, and the natural relationship between price and demand is artificially suppressed (upgrade policies have made this even worse). This gave high-end smartphones (including the iPhone) an unnaturally high share of the smartphone market. The rationale for pricing strategy was that carriers wanted to spur higher data usage by lowering the relative cost of owning a high-end smartphone. However, the results have been questionable. As CIRP's data shows, ARPU is a function of data plans and not of data usage. Smartphone data plans are driven more by income demographics and less by the device used. So a price-sensitive iPhone 4 or 4S buyer may in fact be likely to opt for a cheaper plan. 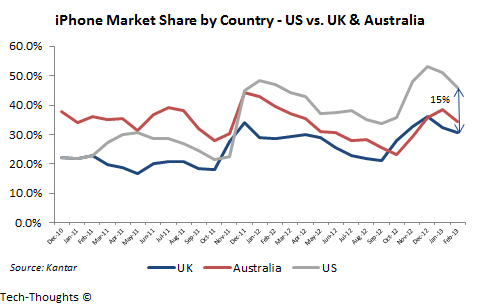 The chart above probably does a better job explaining the iPhone's market share in the UK than most analyst theories. 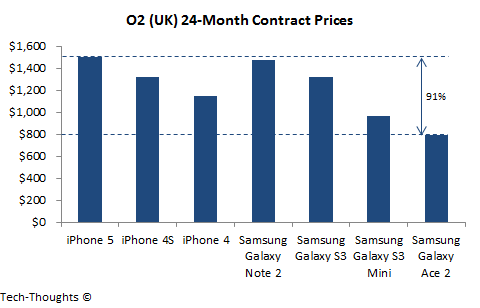 UK carriers vary the monthly cost of a contract, based on the cost of the device itself. 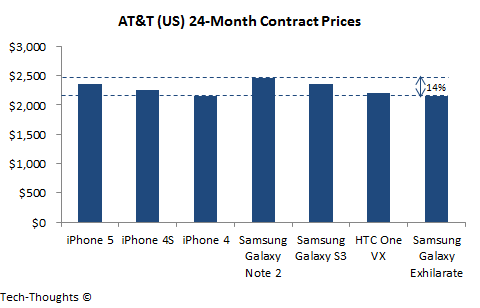 As a result, the unsubsidized prices of devices are far more in sync with the relative contract pricing (the contract price of an $820 iPhone 5 is 91% higher than that of the $224 Samsung Galaxy Ace 2), which leads to a far more natural price-demand relationship. This is also the pricing model followed by most carriers in Europe, which explains the iPhone's relatively lackluster market share in those regions. However, as the chart shows, the prices of comparable data plans, and consequently ARPUs and carrier profits, are far lower in the UK (and the rest of Europe) as compared to the US. This is a direct outcome of high competition in Europe, as compared to the dominance of a few carriers in the US. At first glance, the contract pricing model in Australia seems very similar to the one followed in Europe. But, in actuality, the model is a blend of the US & European models. 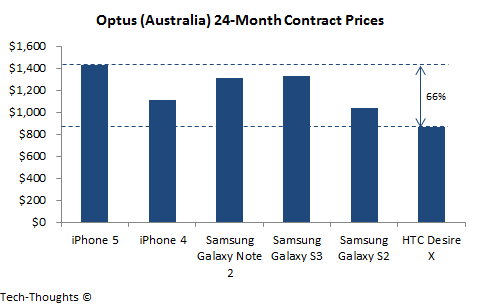 Australian carriers vary the monthly price of contract based on the device until the contract value reaches a certain point. So for high-priced plans, the price of the contract is independent of the device. This ensures that the price-demand relationship isn't overly disrupted (the contract price of the high-end iPhone 5 is 66% higher than the mid-range HTC Desire X), while encouraging potential high-end users toward high-end devices, that could potentially lead to incrementally higher usage. 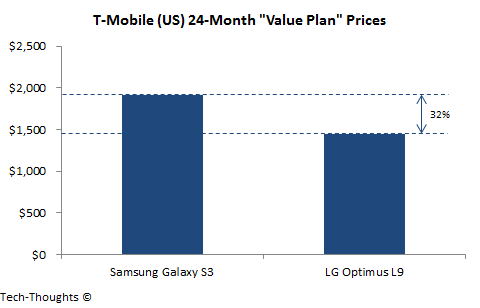 T-Mobile is moving to an unsubsidized, but financed, smartphone sales model this year. As per this model, consumers will have to pay a portion of the smartphone's cost upfront (similar to existing upfront costs) and pay a portion of the price in monthly installments, in addition to a cheaper data plan. This essentially varies the total monthly cost based on the device purchased - The contract price of a $599 Galaxy S3 is about 32% higher than a $369 LG Optimus L9. As more devices are added, this price gap could increase leading to more price sensitivity. If consumers find these plans appealing, and the churn rate among T-Mobile's value plan customers does seem lower, other carriers could rush to emulate this model. As a result, over the next few years, the prospect of US carriers moving to a European pricing model may be far more likely than overseas carriers moving to a US pricing model. The best business case studies state their conclusions in the first paragraph. If the iphone product were a human, it would be an infant. Unable to stand on its own two feet, needing constant support. Explains some customer behaviour. If you say so. A scientist would never write that way. He expects his audience to consider the evidence and decide for themselves. I can't comment on the methods used by scientists, but an analyst is expected to put data in the right context and leverage industry knowledge to base his conclusions. The post is just a way to highlight my findings to those who may be interested. Of course, the audience is free to form their own opinions. And thank you for the comment. It's always interesting to hear from employees of the company in question. Does the fact that the iPhone is best rated for satisfaction, reliability, best store experience, support plus it's users actually 'really' like them...make any such explanation...a bit moot? And US consumers are the only ones smart enough to realize this? I've no idea. I'm just suggesting that there might be other more straightforward metrics that explain iPhone sales around the world ie. not just the US, despite the overwhelming sales of Android devices that are generally cheaper. Perhaps Apple's sales are a reflection of expectations met rather than your interesting theories? Well done, you managed to despoil an interesting article with a post containing an ad hominem inference, a xenophobic slur, some juvenile cant and top it off with a spam link. The goal of this post was not to explain why customers buy iPhones. The goal was to explain the difference between the iPhone's high market share in the US vs. lower market share in other developed economies. Apple sells the same iPhones everywhere, the "user experience" and by extension, customer satisfaction levels (expectations met) should be the same. The fact that I've limited the data to developed markets also minimizes disparities in demographics and wireless infrastructure. At this point, what we have left is price and that's a core driver of demand. Spam link? 100% faster than iphone - not happy with facts eh? Got a cheap Nokia as a contact phone - stainless steel parts! Better quality than aluminium ... on lame subsidises phones.